The accolades keep rolling in for Wild goalie Devan Dubnyk. On the heels of his franchise-record third All-Star appearance, Dubnyk was named the NHL's third star of the week Monday. 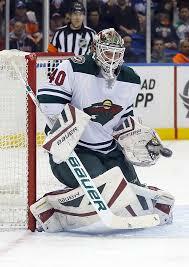 Dubnyk went 2-0 for the Wild last week, posting a .926 save percentage and 2.00 goals-against average in two starts. He racked up 30 saves in a 4-2 win over the Vegas Golden Knights Jan.21 before making 20 stops to help the Wild cruise by the Colorado Avalanche 5-2 Jan.23. At the All-Star Game Saturday, Dubnyk then recorded 25 saves across a pair of contests – including 19 in a 10-4 triumph for the Central Division over the Pacific Division in the semifinals. Overall, Dubnyk is tied for fifth in the NHL in victories (20) while carrying a .913 save percentage, 2.57 goals-against average and one shutout. This is his fifth 20-win season in as many campaigns with the Wild.